Avanti’s proposals to re-habilitate the Florey Building has been approved by Oxford City Council, report the architects. The conservation led scheme which received wide support from Historic England, Oxford Design Review Panel and a range of Oxford Amenity Societies addresses many of the deficiencies of the design whilst strengthening the original organisation of the building. The setting of the building has been improved through removal of a car park and enhanced public realm. Additional rooms have been created without altering the original building form and a discrete new build annexe provides additional support facilities. 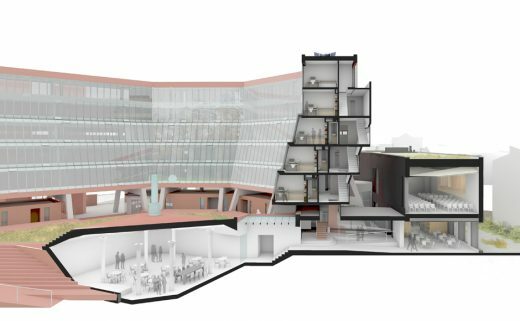 Six studios will consider the typology of the university, through the development of a speculative design over the course of four days (Sep 8 -Sep 11). The studio leaders will present lectures over the course of the masterclass while the Drawing Matter Foundation will stage an exhibition drawn from its holdings of 1960’s architectural drawings. On the evening of September 12th, the studios will present their projects at a public event at London’s Barbican Arts Centre. We welcome applicants at all stages of their career but they must be individual Architecture Foundation members, employees at Architecture Foundation member practices or Architecture Foundation student members. To apply, please submit an illustrated four-page A4 curriculum vitae in pdf format. The deadline for submissions is Monday 9th May at 10.00 pm. Successful candidates will be informed by Friday 20th May and will be required to pay the full fee by Wednesday 1st June. 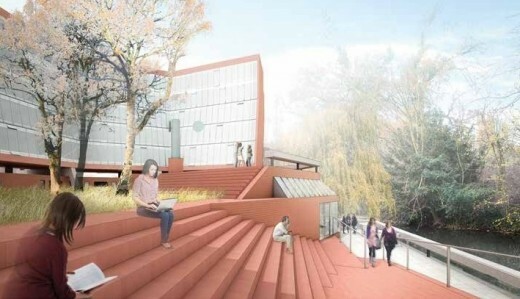 Critics have slammed designs by Avanti Architects to squeeze an extra 25 rooms into James Stirling’s Florey Building in Oxford and create a new two-storey annex building, reports the Architect’s Journal. The plans to reconfigure the 1971 student residences building – the last of Stirling’s so-called ‘red trilogy’ – have been submitted to Oxford City Council on behalf of the building’s owner, Queen’s College. But the proposals for the Grade II-listed building, which involve some internal demolitions, have received a frosty reception from experts on Stirling’s work. Alan Berman, founding partner at Berman Guedes Stretton, said: ‘Years ago I suggested the college would do well to appoint Avanti, whose Modernist restoration work is exemplary, so I was delighted they won the competition. The Queen’s College announced the six teams invited to submit proposals to update the Grade II listed Florey building on 19 Nov 2013, in order to provide modern facilities and achieve exemplary energy design. The Queen’s College seeks a dedicated team to restore and add new facilities to James Stirling’s modernist masterpiece, The Florey building, which is Grade II listed.